On Sept. 21, while delivering a talk on strategic planning, Father McShane also addressed an on-campus racial incident and called on the community to “draw together” in healing. The future of Fordham belongs to all of us, Joseph M. McShane, SJ, president of Fordham, told faculty and staff at two annual convocation ceremonies held on Sept. 21. 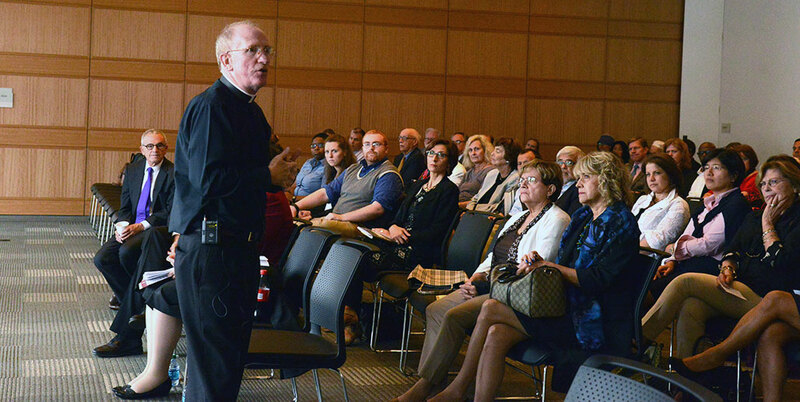 In gatherings held at each of the Rose Hill and the Lincoln Center campus, Father McShane formally unveiled Continuous University Strategic Planning (CUSP), which follows Toward 2016, the 10-year comprehensive strategic plan the University created in December 2005. The incidents are shocking, disturbing, disheartening, disorienting, and makes him furious and very depressed, he said, because they illustrate how the University was not able to protect a vulnerable member of the community. “Please, faculty members who are here, I’m asking you to address these matters—the incident, the causes of racism, and what we can do to get a healed campus back,” he said in an afternoon address at the law school. Father McShane also formally welcomed several new senior members of the administration: Martha Hirst, Fordham’s senior vice president for finance and chief financial officer; Elaine Crosson, new general counsel; Maura Mast, the new dean of Fordham College at Rose Hill; Eva Badowska, the new dean of the Graduate School of Arts and Sciences; Virgina Roach, the new dean of the Graduate School of Education; and Matthew Diller, the new dean of the School of Law. In embracing CUSP, which is being overseen by a 22-member committee from various University departments, Father McShane noted that the world of higher education is changing at an extraordinary rate, and as such, traditional strategic plans are of little use now. “What we have to do is move away from an exercise which would create a document that we are supposed to live with for 5, 7 or 10 years, and move toward a process of continuous strategic planning, which will enable us to be far more agile in reacting or responding to what is going on, and plotting a course that will differentiate us from others,” he said. “[It] means making Fordham the model—‘the,’ not ‘a’ model—urban Jesuit university for the 21st century,” he said. The rest of the afternoon was devoted to a question and answer session with CUSP co-chairs Patrick Hornbeck, PhD, associate professor of theology and chair of the department; Debra McPhee, dean of the Graduate School of Social Service; and Peter Stace, vice president for enrollment. Peter Stace, Debra McPhee, and Patrick Hornbeck answer questions about CUSP. Hornbeck noted that although Toward 2016 had merit, it failed to anticipate such developments as the financial crisis of 2008 or the drops in demand for legal education and graduate studies in the arts and sciences. He made a distinction between strategic planning and operational planning. 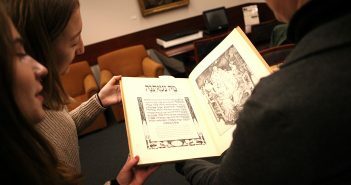 “I think very often here at Fordham we’re used to thinking, acting, or perceiving in certain terms. 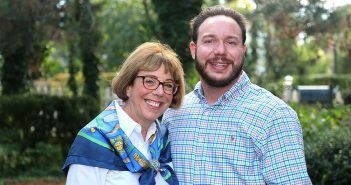 We’ve gotten used to the way that we do our business, and part of this planning is disrupting and figuring out how we can be ourselves in a better, more effective way,” he said. Hornbeck emphasized that although there are 22 members of the committee, the process, which is expected to go through three-year-long cycles, will be inclusive of all members of the University community—from faculty, staff, and students, to alumni and University neighbors. 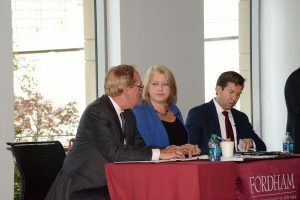 Contributions can already be made at http://www.fordham.edu/cusp. “We’re going to be creating a culture of planning here at Fordham. We want to build planning and planning-related thinking into the work that we do on an ongoing basis,” he said.